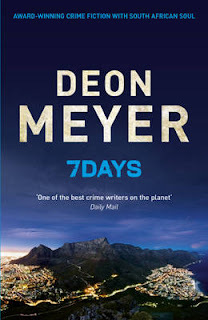 While all of Deon Meyer's crime novels (mostly set in and around Cape Town, South Africa) are related in a daisy-chain fashion, Seven Days is a direct sequel to another recent Meyer book, Thirteen Hours. The cast of both is pretty much the same, detective Captain Benny Griessel of the elite "Hawks" squad and the professional and personal associations around him. In addition, the novels are linked by the time-frame of the titles and the time and setting of the second novel, which closely follows the first. For some reason the novel's title is 7 Days in the U.K. and Seven Days in the U.S., in the editions brought out by Hodder & Stoughton and Atlantic Monthly Press. In both cases, the translator is K.L. Seegers, who does an excellent job of making the language fluid and clear while at the same time giving a flavor of the local mix of dialects and cultures (there's a glossary at the back, but it's really not necessary once you get into the flow of the text). 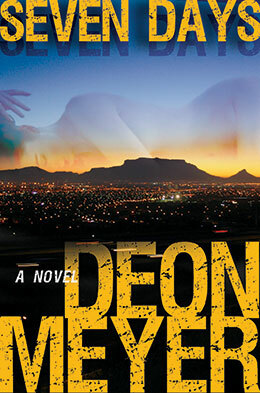 This time Benny, a recovering alcoholic, and his colleagues are confronted with a two-track investigation. A sniper is shooting cops and says he will go on shooting one each day (at first only wounding them) until a recently closed cold case is re-opened and solved. So Benny is assigned the cold case, concerning the murder of a young female lawyer in her own house, and Mbali Kaleni, a "star" of Thirteen Hours, is assigned the sniper case. There are many other detectives and police officials involved, and Meyer does an excellent job of portraying each, including his flaws, and relating their characters to the story. Meyer is here in his police-procedural (rather than thriller) mode, and it's a genre that he is comfortable with. 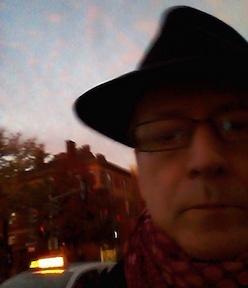 It's not a puzzle, it's a process, and as the team follows leads (a lot of them false) from communists and the Russian mafia to policement and politicians, Griessel agonizes over the slow pace and his own (in his mind) incompetence. Meanwhile, his is struggling with his family and a new responsibility/relationship with another alcoholic, a singer first met in Thirteen Hours. Kaleni is dealing with demons of her own, not only her difficulty being accepted as a colleague by many of her fellow cops (because of her gender and figure) but also because of a rumor regarding a possible scandal that occurred while she was on a training detail in Amsterdam. The last of Harry Hole?